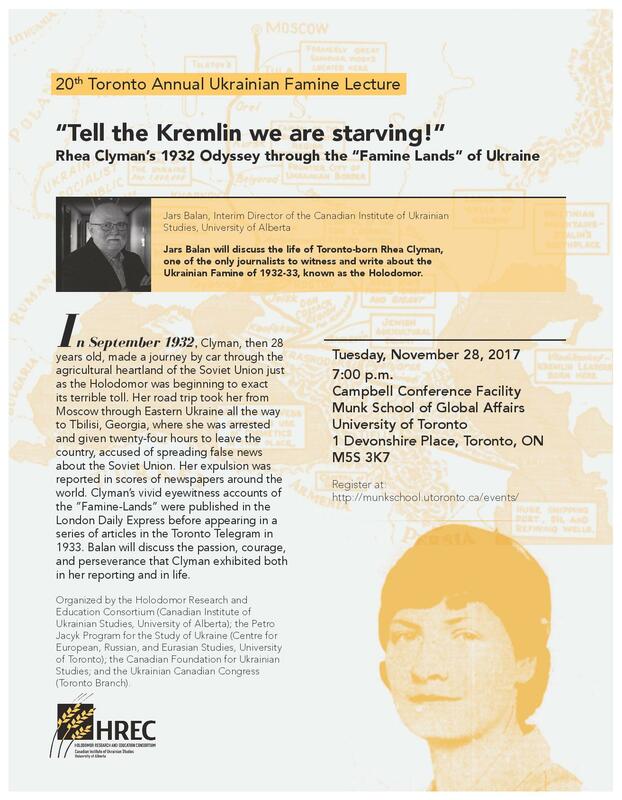 JARS BALAN, Interim Director of the Canadian Institute of Ukrainian Studies (CIUS), University of Alberta, will deliver the 20th Toronto Annual Ukrainian Famine Lecture, “Tell the Kremlin we are starving; we have no bread!” Rhea Clyman’s 1932 Odyssey through the “Famine Lands” of Ukraine. Jars Balan will discuss the life of journalist Rhea Clyman, one of the only journalists to witness and write about the Ukrainian Famine of 1932-33 known as the Holodomor. Born in Toronto to a poor immigrant Jewish family, Clyman encountered adversity early in life, losing part of one leg in a streetcar accident. In September 1932, Clyman, then 28 years old, made a journey by car through the agricultural heartland of the Soviet Union just as the Holodomor was beginning to exact its terrible toll. Her road trip took her from Moscow through Eastern Ukraine all the way to Tbilisi, Georgia, where she was arrested and given twenty-four hours to leave the country, accused of spreading false news about the Soviet Union. Her expulsion, the first by Soviet authorities of a Western journalist in eleven years, was reported in scores of newspapers around the world. Clyman’s vivid eyewitness accounts of the “Famine-Lands” were published in the London Daily Express before appearing in twenty-one feature articles in the Toronto Telegram in 1933. Balan will discuss the passion, courage, and perseverance that Clyman exhibited both in her reporting and in life. Balan has been involved with CIUS for almost four decades and has an extensive list of scholarly publications. Since 2000 he has overseen the administration of the Ukrainian Canadian Studies Program, and in 2007 he was appointed coordinator of Kule Ukrainian Canadian Studies Centre (CIUS). He is working on a book about Rhea Clyman. THE TORONTO ANNUAL FAMINE LECTURE began in 1998 at the initiative of the Famine-Genocide Commemorative Committee of the Ukrainian Canadian Congress, Toronto Branch. Past lecturers have included James Mace, Norman Naimark (Stanford University), Alexander Motyl (Rutgers University), Anne Applebaum (Washington Post), Timothy Snyder (Yale University), and Serhii Plokhy (Harvard University). The lecture is organized by the Holodomor Research and Education Consortium (HREC), a Toronto office of the Canadian Institute of Ukrainian Studies (University of Alberta); the Petro Jacyk Program for the Study of Ukraine at the Centre for European, Russian, and Eurasian Studies (University of Toronto); the Canadian Foundation for Ukrainian Studies; and the Ukrainian Canadian Congress (Toronto Branch).